Izabella Krolle was born on May 22, 1938. In 1940’s Izabella’s father was repressed, and in 1946 her mother with two daughters moved to Rīga where Izabella graduated from Riga Primary School No.49, and later in 1957 from Ceramics Department of Riga College of Applied Arts. From 1957 till 1963 she continued her studies at the Department of Applied Arts in the Art Academy of Latvia. Izabella Krolle participates in exhibitions since 1958. Her works have been exhibited in group exhibitions in Latvia and abroad. Izabella Krolle is also one of the founders of the Ceramic School in Ķīpsala. However the painting and graphics have always been close to the artist, though ceramics have the key role in her creative work. There is a searching spirit that lives inside the artist, so she is experimenting with shapes and surface processing techniques. I. Krolle is keen on contrasts, so to feel the shape she almost always accompanies it with paintings of a rich fantasy. In her works the artist deals with colour and surface of ceramic pieces to accurately reflect the psychology of the created image. The imagery of Izabella Krolle art is vivid and striking, in her ceramic works temperament and attitude are active and free, thus creating an energetic liveliness. The artist likes to build large-scale even monumental work, drawing inspiration from natural forms and shapes. 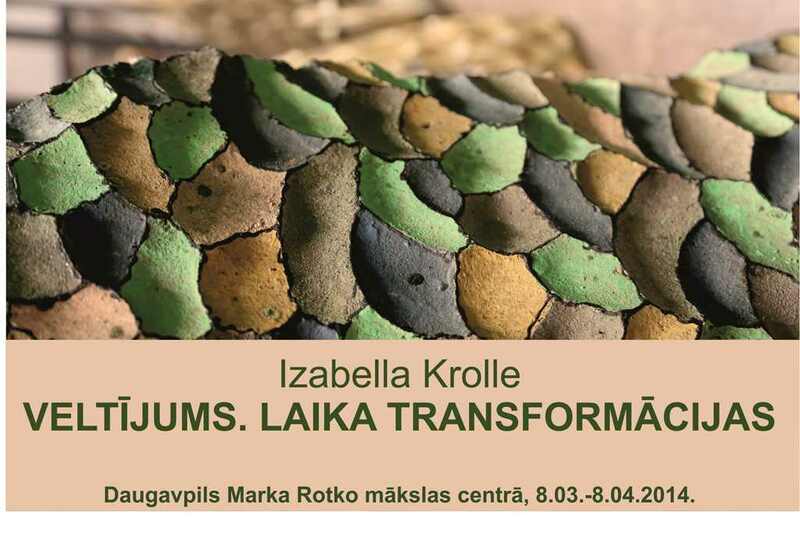 Due to the sense of belonging to her hometown Daugavpils, ceramist and artist Izabella Krolle donated 27 of her artworks – splendidly painted large-scale chamotte sculptures, monumental mosaic pieces and a painting on wood to Daugavpils Mark Rothko Art Centre. Those are artworks from the period between 1972 and 2013 which reflect the spirit of searcher and experimenter of the ceramist. The donated artworks impress with a richness of imagination and the accuracy of performance. The exhibition “DEDICATION. TRANSFORMATIONS OF TIME” displays a small part of the artist’s donation to the art centre. It is both an artist’s tribute to her hometown, as well as a projection of her inner world emerging in an artwork transformed by the time. The exhibited works are fantastic large-scale ceramic sculptures which figuratively interwove something like Oriental fairy-tale characters and anthropomorphic forms of nature.